As the centenary of David Bomberg's first solo exhibition approaches, the latest exhibition at Borough Road Gallery, London South Bank University (LSBU), 'David Bomberg: Objects of Collection', returns to the master of the Borough Group. The exhibition, which opens its doors to the public today, focuses entirely on David Bomberg and gives visitors the first opportunity to experience works from the A David Bomberg Legacy The Sarah Rose Collection and the University art collection together. Funded by the Heritage Lottery Fund, Borough Road Gallery's exhibition features work spanning nearly the whole of Bomberg's career, including a painting created during Bomberg's time as a teacher at the Borough Polytechnic, now LSBU. David Bomberg is regarded as one of the twentieth century's most significant British artists and art teachers. He rose to prominence in the early twentieth century, when his geometric style was associated with the Vorticist Group. After the First World War, he abandoned this early approach in favour of a close study of nature. For the rest of his career, he developed an expressive, energetic style that strived to articulate 'the spirit in the mass'. To accompany the exhibition, short texts have been invited. Contributors include award-winning art critic Richard Cork, curators Rachel Dickson and Sarah MacDougall from Ben Uri Museum of Art, Identity and Migration, and Cass Breen, Deputy Principal at Morley College, as well as a number of academics from LSBU. 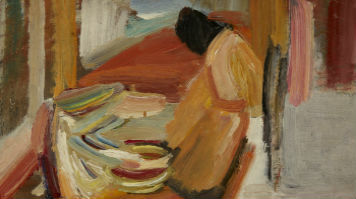 "We are delighted to be showcasing David Bomberg at Borough Road Gallery, not only through exhibiting little-seen work from these two collections, but through the dynamic selection of writing by leading curators and academics that has been specially commissioned for the exhibition", says Andrew Dewdney, Project Director at Borough Road Gallery and Professor of Educational Development at LSBU. "We are grateful to all the contributors for supporting the gallery with such thoughtful and insightful texts, providing material that will enrich visitors' understanding of Bomberg and the individual works collected by Sarah Rose and the university over the last 30 years." A specially curated series of talks and events will also be accompanying the exhibition. Confirmed speakers include Richard Cork - author of David Bomberg (1987), which is to date considered to be the definitive guide to the artist - and Dr Leon Betsworth, post-doctoral research fellow at LSBU, who is currently researching David Bomberg's time as a teacher at the Borough Polytechnic in the 1940s and 1950s. David Bomberg: Objects of Collection will run from 13 September 2013 - 29 March 2014 at Borough Road Gallery, Faculty of Arts and Human Sciences, London South Bank University, 103 Borough Road SE1 0AA. Opening times are Wednesday - Friday 1 - 5pm and Saturday 12 - 5pm. Closed for Christmas & New Year: 15 December - 7 January. Re-opening 8 January 2014. Find out more about Borough Road Gallery.